10 pieces per design minimum. $100 Minimum Order. Name Dropping available on all magnets - 24 piece per design minimum order, add .10 cents for each magnet. For orders over 144 pieces / Name Drops = no charge. Check out our Image Library for Custom Magnet Designs! 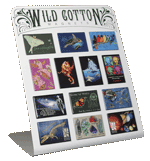 Any Wild Cotton® Design, including everything in our archive of retired designs, is available for printing onto garments on a custom basis. 52 items found in this category. "Fallout Shelter 2" X 3" Magnet"